Empireonline.com has revealed (and then removed) the cover of the May 2012 issue of Empire Magazine. The next issue, which will likely reveal a few new bits on the upcoming Prometheus film, will be in stores on March 29th. Click below to see the cover in full resolution. In related news, Latino-review.com has posted up the first TV Spot for Prometheus which aired during last night’s season finale of AMC’s The Walking Dead. You can watch the video here or after the cut. The ambiguity of the rating is also a part of the marketing at this point. No one knows what it will be, and we'll keep guessing up until the last minute. At this rate, if they go PG-13...they'll risk definite outrage. They're in a tight spot. In one of the other snippets it sounds like they did go for an R rating "the little bastards are going to get in anyway" I think he said. That sounds fairly hopeful. "[I've wanted to revisit it for] years! Years, years, years," he stresses, of Alien's space traveller subplot. "I always wondered when they did [Aliens] 2,3 and 4 why they hadn't touched upon that, instead of evolving into some other fantastic story. They missed the biggest question of them all: who's the big guy? And where were they going? And with what? Why that cargo? There's all kinds of questions." Another question for Scott is the film's rating. He hints that the violence may have been toned-down enough to facilitate a PG-13 rating, but intriguingly suggests that the impact will match the R-grade shocks of Alien and Aliens. "The question is, do you go for the PG-13, [which] financially makes quite a difference, or do you go for what it should be, which is R? Essentially, it's kinda R."
Just waiting for the last 2 pages. There's a shot of Vickers sitting in what looks like a waiting room or an office that reminds me of Rachel in the Tyrell corporation. It's got this futuristic yet 1920s aesthetic to it. Prometheusnews.net is missing quite a few pages. Wait for Michael's HQ ones. Very cool stuff. I think I spot a Michael Fassbender double in one of the pictures? Aka multiple Davids? I don't think there's anything definitive in terms of the rating Yet. Damnit, so frustrating! I hate the pitter patter around the PG-13 vs R. If it's going to be PG-13, he should just say it outright and not sugarcoat things. Sorry, vent over. I'm a little bummed out. I knew that it was very likely it would end up being PG-13 but I was holding out for an R rating. The original Alien was R. He shouldn't be having to tone anything down. On a lighter note, really looking forward to seeing the new images. Please check your PMs, Michael. Sending you them in an Email now (they're big files, so hopefully they'll send in one email). Ridley says in the interview that the next piece of marketing will be like the TED Conference, but will be about David - and he will be talking, and at the end he puts his finger on the screen and there is the W for Weyland in his finger print! Ooh, excellent piece of information! Any idea of when we can expect it? Nice, Thanks for this tidbit! So are you still intended to scan the pages tonight? I'm scanning them now in the managers office in work (he's a cool guy), so I'll try and get them up very soon! I've just received the new EMPIRE magazine in the post. The cover art is actually fantastic - all the blue is reflective and feels cool! Inside there is a 14 page look at the film, and some new images - I haven't read it yet because I've only just got home and will be heading out to work in 15 minutes (gonna read it on the train) - but there is an interesting shot of Vickers (Charlize Theron) in what appears to be some kind of lobby, or foyer, or office room - I'm gathering that this is possibly Weyland Industries on Earth. I'm sure somebody will get pictures up online soon, but if not I will scan them when I get home at about 11:00 tonight! Looks like it will be a set visit mixed with some interviews. By the way, that monster sound is a scream that has been used in so many trailers and films. It's disheartening to hear such an identifiable stock sound used in what may be an incredible and unique film. I like seeing Shaw with the crucifix necklace out like that, nice touch. I'm sorry, but that is a horrible pic, the head doesn't even look like its belongs. "New Alien, New Ripley", huh? sounds like they're replacing the old one and I don't think that's case, but that's the impression I got. Oh wait...Lindelof made a great point that if the film doesn't do well then people will blame him...and he's right. He also made the same point at WonderCon. He was right then, too. Absolutely nothing new but it was a fun read. Thanks. UGH. Once again, Lindelof proudly refers to himself as a "fan boy." Looks like all of them have. 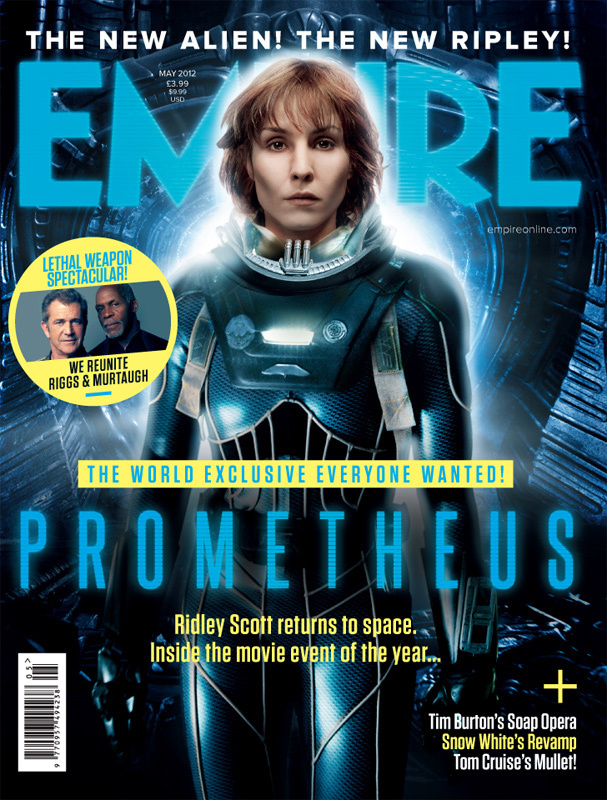 Anyone know what the PROMETHEUS article in Empire will be like? Will it be substantial enough to purchase? I passed over the EW issue because it just didnt seem worth it with such meager text and stills you could get in higher quality online. ...what makes him so robotic! Thanks for posting this cover, i like it much more than Empire's one! "Ridley Scott returns to the ALIEN Universe" It's a lot of "ALIEN" in only two mag covers. Off topic. Your new sig is great Cvalda and the Griping Thread is definitely a success. Thx bioweapon. The monster sound at 0.24 ? Definitely not Xeno. The sound has no real significance. They just looped a portion of the audio track from the IMAX teaser--that sound comes from the quick shot of Noomi looking up in horror at he sqiggly child-thing. It can. In the Intl. Trailer when Shaw is front of the mirror you can ear someone (maybe Holloway) says with a strange voice "It's in my suit, It's in my suit". Could be the same person. It sounds like something's got sqaushed... Creepy. I don't like they labeled Shaw with a tag "New Ripley". Doesn't Rapace's character have her own personality, attitude and life?.. Awesome! Thanks bioweapon! Posting the new shots from this spot in the trailers thread now. That's odd. Apparently Empire tweeted the cover this morning but deleted everything shortly after that. Awesome pic anyway! That's the point . They announced and then removed it. Can't wait to buy this! The perils of PhotoShop...OUCCHH!!! She looks older than my mother, and that ain't right!! Great article all the same. Nice to finally see some detailed screenshots!